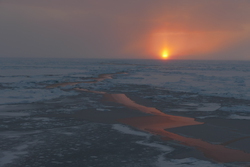 A sunset reflected in a newly-frozen lead in the sea ice. Aboard the USCGC Healy at the Alpha Ridge in the Arctic Ocean. Photo by Bill Schmoker. MOSAiC observations will be specifically designed to characterize the important processes within the atmosphere-ice-ocean system that impact the sea-ice mass and energy budgets. These include heat, moisture, and momentum fluxes in the atmosphere and ocean, water vapor, clouds and aerosols, biogeochemical cycles in the ocean and ice, and many others. In September 2019 the German research icebreaker Polarstern will depart from Tromsø, Norway and, once it has reached its destination, will spend the next year drifting through the Arctic Ocean, trapped in the ice. Katie Aspen Gavenus grew up in the not-quite-Arctic town of Homer, Alaska. She is an environmental educator and program director for the Center for Alaskan Coastal Studies. She recently completed a master's program in science education through IslandWood and the University of Washington and is committed to making science education - and education more broadly - locally relevant, culturally sustaining, inspiring, and empowering. She believes science education should be a collaborative effort between learners, educators, researchers, knowledge-bearers, and community members. She enjoys learning, kayaking, picking berries, hiking, catching salmon, playing soccer, growing food and tide pooling. She makes good soup and is perfecting a yeasty-biscuity bread recipe. Her favorite type of plankton is ctenophores/comb jellies and she has a tiny scar from being bitten by an intertidal worm. Anne is the Director of CIRES Education & Outreach at the University of Colorado in Boulder, where she focuses on science education for educators, students and the general public around climate and general geoscience education. She is interested in understanding and studying effective ways of teaching and learning and is dedicated to grounding her education work in solid research and evaluation. She is a climate scientist by training with a doctoral degree in Paleoclimatology from the University of Regensburg in Germany.